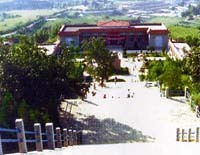 Situated at the foot of Hutou Mountain, the village used to experience the adversity of nature. In the 1960s, the Dazhai people carried forward the spirit of hard work, and transformed the mountains and reclaimed farmland. Dazhai became an agricultural model nationwide for its great achievements. After the introduction of reform and opening, Dazhai people have carried on their spirit, going to great lengths to develop a collective and export-oriented economy. This has brought profound changes to the appearance of the village.